Goldenrod Wine Recipe - Home Brewing, Wines & Beers etc. This goldenrod wine recipe produces an interestingly flavoured medium wine. 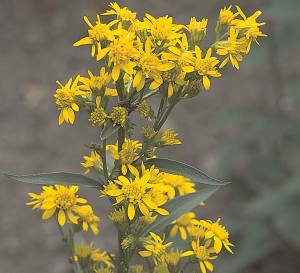 Goldenrod is best known as a medicinal herb said to be useful in the treatment of a wide number of complaints including urinary tract infections. It’s also known as Aaron’s Rod and Woundwort. It is a perennial herb that naturally grows wild in woodlands and hedgerows. At one time its yellow flowers on the tall woody stems was a common sight but it can be hard to find nowadays. As with all foraging, do not trespass, take more than you need or completely strip plants bare so they cannot reproduce. Seeds are available if you look around and the herb will grow domestically in both full sun and dappled shade. Wash the flowers in cold water to remove any lurking insects and place in a fermenting bin or wine bucket. In the pan, mix the sugar and gallon of water. Heat to boiling stirring to dissolve the sugar and then pour onto the flowers and orange juice. Stir well. Once cooled to 20°C add the wine yeast and nutrient, stir and cover. Leave for 5 days in a warm place, stirring daily and keeping covered. Put the chopped raisins into a demijohn and then strain the off the liquid into the vessel. It shouldn’t need topping up but do so with cooled boiled water if necessary. Fit the airlock, put in a warm place and leave to ferment to a finish. Remove to a cool place for a month once finished before racking off and bottling. Should be drinkable after 6 months but best left 18 if you can.